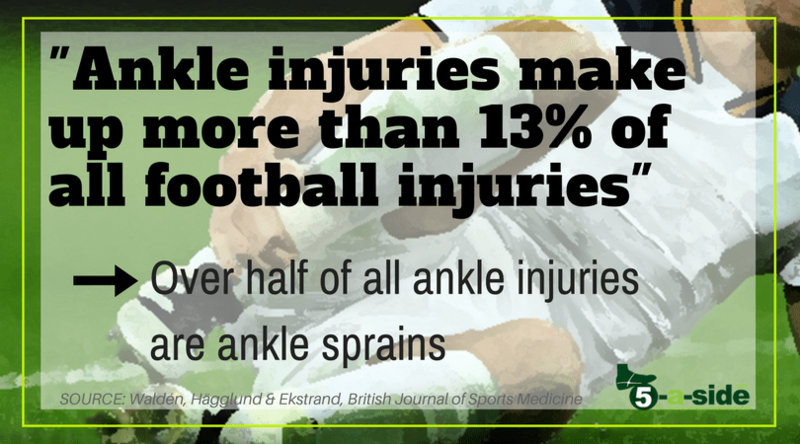 Ankle injuries are among the most common injuries in football. In fact, records gathered for all injuries over an 11 year period in the Champions League showed that ankle injuries made up 13% of the total. That’s clearly significant. Of that 13%, just over half were due to lateral ligament ankle sprains. That’s the one you commonly see, where the ankle is twisted inwards, inflicting tissue damage, which produces a swollen ankle and a great deal of pain. I’ve lost count of the number of times I’ve seen players hobble off the pitch with that injury over the years. 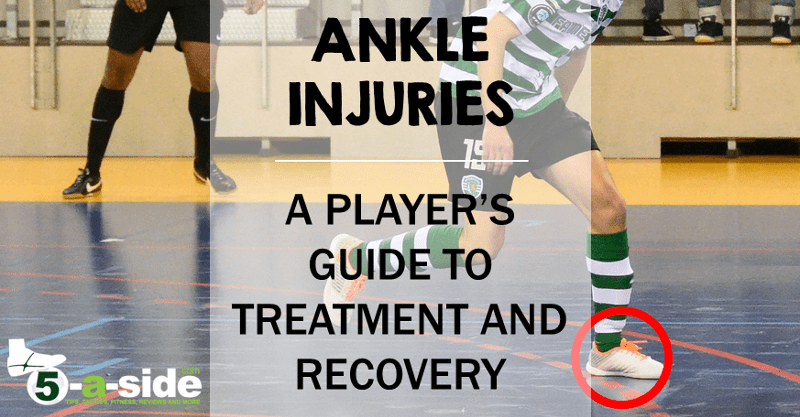 In this article, we’re going to look further into ankle injuries, what causes them, how to treat them and how to avoid them. And fortunately we’ve got the help of expert Physiotherapist, Paul Bryce, Clinical Director for online physio service JimJam to guide us. What’s the basic issue with ankles – why do they get injured so much? “The foot and the ankle are a fantastically detailed structure but we place enormous demands on these structures and that’s the reason we have ankle injuries,” explains Paul. The fact is, that by its very nature, football puts additional strain on the ankle above what’s required in your daily life. The things we routinely rely on our ankle for, like walking up and down stairs, are very different to needing to quickly change direction on the football field, or going up for a header and landing awkwardly. Then on top of that there’s the fact that football is a contact sport, where clumsy (and sometimes downright reckless) challenges occur, putting our ankles under almost unreasonable amounts of stress. 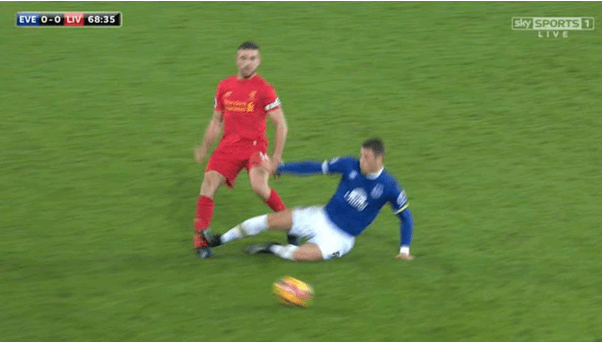 Things you just can’t legislate for, like this shocking tackle Ross Barkley committed on Jordan Henderson. Luckily Henderson walked away without injury. In 11 years of Champions League history, more than half of all ankle sprains (58%) were the result of player contact. Interestingly, however, only 40% of match-related sprains were the result of a foul (and only 5.8% of these fouls were red or yellow cards) – so it’s not just playing dirty that does it. But regardless of whether it’s as a result of contact with another player, or simply your own doing, when you’re putting severe stress on a major weight-bearing part of the body, it can be a recipe for disaster. 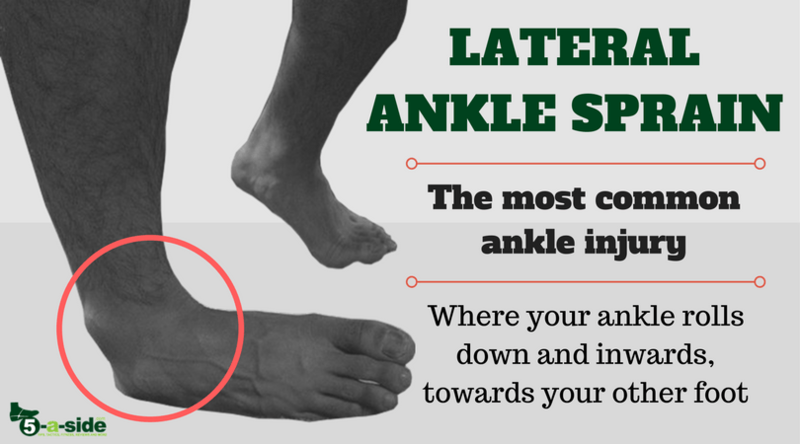 Statistically, by far the most common ankle injury is the lateral ligament ankle sprain. Paul thinks that’s probably the most common injury he sees as a physio too. It’s not just common among footballers; basketball players, tennis and rugby players also get a good dose of this affliction too. Basically any sports that involve a change of direction will have a share of this type of injury. A common thing for people to say, as if to prove how severe the strain is and what a hero they are, is “I’ve done my ligaments”. “The truth is, if you have an episode of instability and you go over on your ankle, you’re always damaging your ligaments, it’s just varying degrees of damage, and you know there’s connective tissue, soft tissue, involved,” clarifies Paul. Whilst the lateral ligament strain is the certified A-lister of the ankle injury world, there are some other nasty injuries out there too. When you go over on your ankle, you’ve got three potential ligaments involved. In an incident of injury, the majority of the time it’s about the anterior talofibular ligament (that’s the ligament to the outside and front of your ankle). The other two ligaments that are sometimes affected are the Calcaneofibular ligament and the Posterior Talofibular. Luckily injuries to these ligaments are much less common than the ATFL sprain. You’d treat them in much the same way, however. We’ll cover treatment below. Rupture – an ankle sprain is where your ligament has been damaged but can still stabilise the ankle. An ankle ligament rupture, is where the ligament ends are no longer joined together and cannot stabilise the joint – a complete tear. A rupture is much less common than a sprain. Synovitis – this refers to an inflammation around the connective tissue, around the ankle joint capsule. Though it does occur from time-to-time, it’s generally not a sports-related injury like an ankle sprain. Contusion – This is simply where you end up taking a knock, most likely a kick, to your ankle which can be very painful at the time, causing bruising, but it doesn’t involve twisting, so the ligaments aren’t affected. Fracture – this is the really gruesome one. If you go over on your ankle severely you can sometimes end up with a fracture. It’s possible to fracture your fibula and, in some cases, your tibia as well. These are major, important bones in your lower leg. Something like this would show up on an x-ray, but a physio should also be able to spot this too. Ankle injuries are generally painful, and certainly inconvenient as the ankle is in almost constant use. The pain can often make you think it’s very serious, but how do you really know? You are struggling to weight-bear – I.e. you can’t put any weight on it. There is an obvious deformity – you’re seeing severe swelling, or the ankle isn’t in the normal position that it should be. You have ‘bony tenderness’ – if you’re feeling this, it will be extremely sore, and not just feel like ligaments or muscles that have been sprained. These sorts of signs can point to fractures (though that’s not a full-gone conclusion), which are serious and need quick attention from medical professionals. Also look out for any numbness or lack of active movement developing later on, as those can also indicate more serious problems. When it comes to sprains rather than fractures, these are still reasonably serious injuries, involving ligaments. So it’s important, even if it’s just a mild ankle sprain, that you’re avoiding any further injury, in order to let the recovery take place. A sprain might look something like this: swollen (you can’t even see the ankle), and some discolouration. The pain is likely to be intense and sometimes it can be difficult to tell it apart from a break. With sprains, it’s all about trying to apply the RICE principles in the short term. That means resting (R) the injury, applying ice (I) and (C) compression to it, as well as elevating (E) it to stop the swelling. See our guide to treating injuries with RICE for further details on how this works. You’ll want to keep the ankle protected and make sure that you’re getting appropriate rest for the first 24-72 hours after the injury. Sometimes it’s necessary to use crutches over this period. But don’t go crazy when it comes to compression. “We never ask people to compress through the night because if you compress nerves and blood vessels for too long you can have problems,” says Paul. If you’ve received a kick and it has resulted in tenderness, then that might not necessarily be a sprain. That can be what physios refer to as ‘contusion’, or in other words a bruise. This sort of injury is less serious than a sprain and shouldn’t keep you out for a long time, but it’s still worth managing it initially using RICE principles. You won’t need to go through a rehab process, you just need to avoid taking any further contact to the area whilst you let it heal. Fortunately most ankle injuries don’t require operations. Most professional players return from mild ankle sprains within 2-3 weeks, as long as a thorough rehabilitation is completed. A good rehabilitation programme is the important factor. According to Paul “the key with musculoskeletal injuries is that you want to crack on with your rehab quite quickly and introduce some movement. One of the problems with ankle injuries is it’s swollen and you might not be able to walk very well. It’s not all about rest. At some point you’ve got to start moving it again. For example, try tracing the alphabet with your toe, to stimulate ankle movement in all directions. The biggest, most important aspect of recovery is something called ‘proprioceptive rehabilitation’. Essentially, this means working on your awareness of the position of your joint in space, doing balance work for example. See the exercises recommended below, to get you started. The soft tissue around the ankle joint is rich in receptors called proprioceptors. And it’s these proprioceptors that give you the feedback about the position of your joint. After an injury you need to retrain them because, even once the tissue has healed, if you’ve not retrained the loop that sends messages to muscles (and the muscles that move joints) and feedback to the central nervous system about the position of those joints, it’s far more likely that the injury will reoccur. Practically, there are a couple of things you can do, particularly to improve your proprioception. You can start these balance exercises as soon as you can stand up without pain. Start off with single leg balances standing on the floor, putting your arms across your chest. Paul points out that a good way to compare how successful you are at this balancing is to compare it with your other side: “that’s the only good thing about having a bad side is that you have a good side to compare it with”. 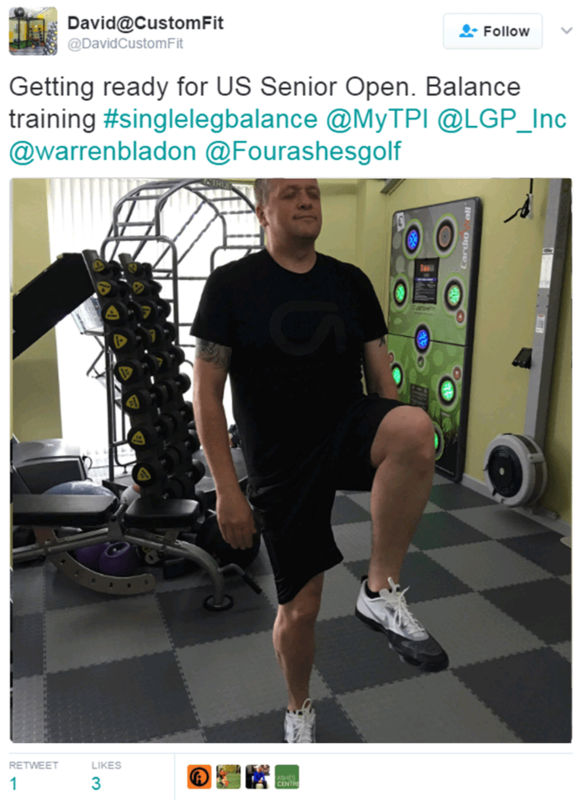 If you can balance on one leg, do it leaning to your left and your right, or with your eyes closed or standing on a wobble board (if you don’t have one of those you could try folding up a cushion and stand on that, or even a trampoline in the garden), then compare it with your other side. If you’ve still got an asymmetry between the two sides, then you should ask whether you’re really ready to be going back out onto the pitch. 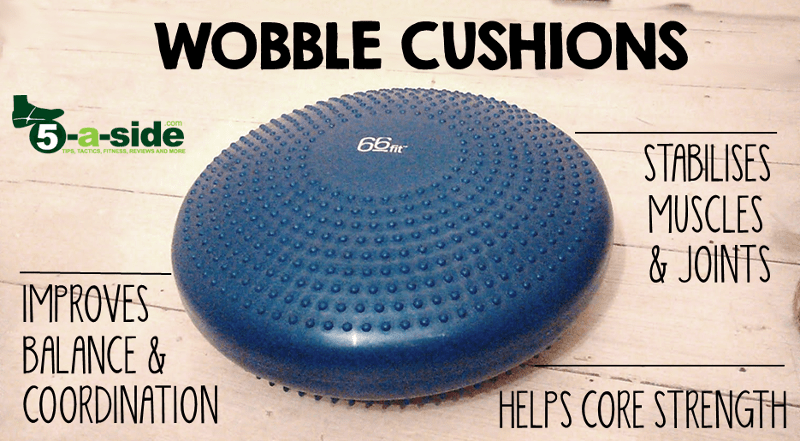 A wobble cushion* can be a useful balance aid, but even without it you can do exercises to improve your balance and proprioception. Running in a figure of 8 to practice using change of directions. Clock-face jumps: Imagine yourself standing in the middle of a clock face where you jump out to 12 o’clock, then back to the middle, then out to 3 and back to the middle, and so on, going all around the clock face. This helps practice landing on your ankle from a variety of angles. Find a step and hop up onto it, controlling your landing so it’s steady. Then hop back down, also controlling the landing so that it’s steady. This sort of exercise can help with preparing you to jump and compete for headers, back in a game. These exercises help you replicate the component parts of playing football, in a controlled manner. If you’ve done a full and thorough rehabilitation, working up to these exercises you’ll be much better positioned to return without having a reoccurrence of the ankle injury. Much of the time, rehabilitation is poor, inadequate or incomplete. Whilst it’s easy to sympathise with the player who just wants to get back out onto the pitch, inadequate rehabilitation is simply asking for a relapse in future. It’s one reason why ankle injuries can seem to plague players for ages. The fact is, the injury arises in the first place because of the demands that have been placed on the ankle. When you have an ‘incident of instability’ that the physios talk about, the ankle becomes less stable in future so you really need to strengthen and stabilise it again before going back for more. Practically, all of the balance exercises mentioned above will be a great protection (although not a guarantee) against injury in the future. If you can do them, and keep yourself sharp then you’ll lower your chances of injury. Also, it has to be said that if you’re carrying extra weight, you are also at risk of putting excess force through your ankles, risking injury. Additionally, some people’s biomechanics can make them more susceptible to ankle injury. Somebody with a flat foot, or an overpronator, for example might benefit from wearing a specific insole to give them more stability. A physio can help advise on this. In terms of avoiding kicks and knocks to the ankle, you might also consider wearing an ankle guard. Ankle taping – is it a good idea? One solution sometimes proposed for ankle injuries is taping and bracing the ankle. There’s no doubt about it, ankle injuries can be the most frustrating injuries out there. Often they’re not properly diagnosed, treated or rehabilitated. Fortunately, you now know what to do next time one strikes. Thanks guys I really appreciate it . Also thanks Paul .